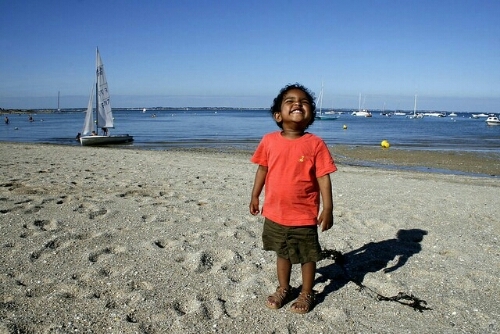 This is a shot of my son, taken in Brittany last summer. We caught the ferry across from Southampton and stayed just a few miles outside Rennes. Unsurprisingly for France the food was delicious even though we had to cook most of it ourselves as the gite we were staying in didn’t come with a built in chef. Having our own car to get around was more than handy as it allowed us to bring a fair few home comforts with us, including jnr here. Oh yes and there was lots and lots of sunshine. View from the George III, Dolgellau, Wales, originally uploaded by bongo vongo. During a short break in Mid-Wales we stopped at the George III hotel restaurant just a couple of miles down the road from Dolgellau. Had a well prepared Moules Marinieres at the restaurant and the service was friendly. Best of all was the view of the setting sun from the balcony where many people seemed to be enjoying a drink while looking over the lake. My life changed the day my son was born. I imagine fathers throughout the history of mankind have said much the same thing. But nearly 11 months ago I was the one saying it. Actually, I’d begun changing before he was born as about this time last year, with a focus and determination never before experienced by yours truly, I looked for and found a new more secure job. I took up this position about a couple of weeks after jnr was born. 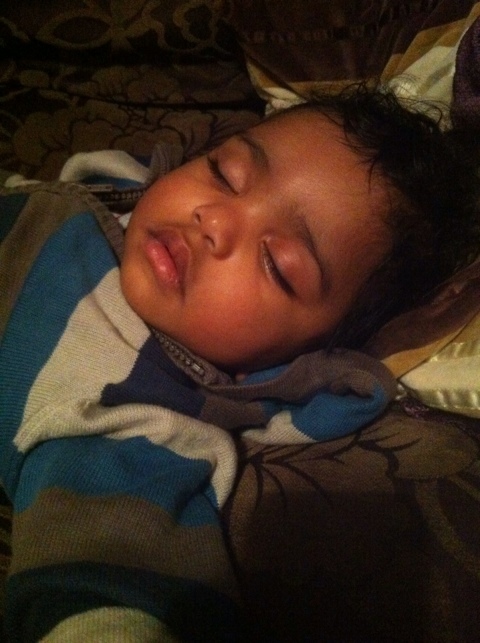 But how has jnr changed my life? In the usual ways for a start after all I am writing this post at 6 in the morning on a Saturday and count myself lucky that I had nearly 5 hours sleep last night. Yesterday I was thinking it remarkable that I, a self confessed telly addict, am happy that with the advent of jnr my viewing habits have changed so that I’ll now watch in a week about as much as I sometimes did in a day. That’s definately a change for the better although it means that I no longer know anything about the lives of the desperate celebrities and wannabies occupying airtime singing, dancing and otherwise surviving their way through the schedules. No real loss I think. I have, however, felt the loss of my old frankenstein pc, which sadly whirred slowly into life for the last time during the great clear out that preceded jnr’s arrival. The loss has been mitigated mostly by my iPhone which is also responsible for my conversion to Apple offerings as the sheer convenience of the OS on their products more than makes up for the nauseating fanboy hagiography that accompanied Steve Jobs passing. The iPhone is also a great hit with the lad as he’s taken to it like a cat to catnip. So much so that he doesn’t understand why he can’t get a tv to change content simply by swiping the screen. His favourite things on the iPhone are the Muppet Show clip featuring Animal and those weird pink cow-like things singing the Manamana song, a delightful little app called Peek-a-boo and the classical Spanish guitar track by John Williams called Asturias. This last favourite of his makes me feel particularly proud and I hope he inherits my love of all things Spanish but not my complete inability to play a guitar after over 20 years of owning one. This week marks the first time in over a year that jnr’s mom and I have managed to go for a meal together, alone, at a restaurant thanks to ‘Granma Mary’ jnr’s new childminder. Although we talked of nothing else other than the baby as we anxiously and somewhat guiltily munched our way through a couple of delicious ‘Romano’ pizzas. The main thing I’ve realised about being a dad is probably cliche but that’s because it can never be learned only experienced, that the hardships and sacrifices I necessarily made for my child is no less than was made for me by my own father when I was born. Indeed things were probably harder for him. It’s, therefore, particularly gratifying to be told by several relatives at a family gathering earlier this week that jnr, who we’ve nicknamed Bubu, looks like his grandfather. Perhaps I’m beginning to understand the poet’s observation that the Child is Father to the Man. 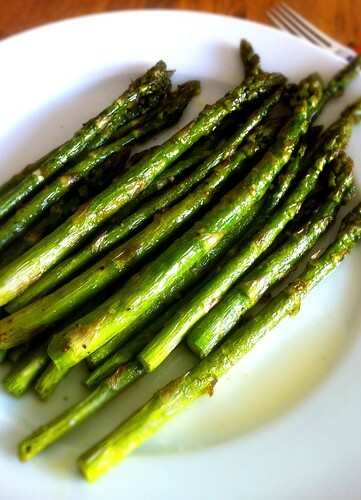 Roasted Asparagus, originally uploaded by bongo vongo. The farmer from Evesham, who grew and sold me the asparagus, suggested a cooking method. Boil them for 12 minutes and then serve simply with butter. I consulted the Internet and decided to roast my bunch instead. Olive oil, salt, pepper and chopped garlic cooked in the oven at 200 degrees Centigrade for about 12 minutes. Delicious even if I say so myself. Asparagus, originally uploaded by bongo vongo. Drove to Evesham yesterday. Saw a farm shop just outside the town. A sign said locally farmed asparagus was being sold inside. I bought a bunch. 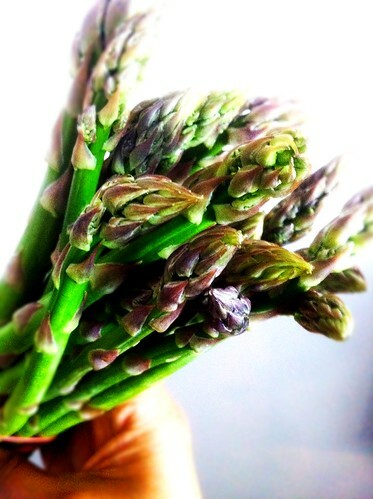 It’s the season for asparagus. The Vale of Evesham grows the best.